﻿ SVG flights to Carriacou - Grenada. Osprey ferry schedule. SVG flights to Carriacou - Grenada. Osprey ferry schedule. Transportation to Carriacou from Grenada by boat or plane. Flight schedules and ferry departure times. Flights to Carriacou from the Grenadines. Guides » Osprey ferry and flights to Carriacou with SVG Airlines. Osprey ferry and flights to Carriacou with SVG Airlines. Flights from Grenada to Carriacou with SVG Air and transport with the Osprey Ferry. Daily flights between Grenada and Carriacou with SVG Airlines. Travel north bound form Grenada’s Point Salines International Airport to Lauriston AIrport on Carriacou. Visit the SVG AIR website. The plane of SVG Airlines at lauriston Airport. Flight schedule Grenada – Carriacou – Grenada. Flights to carriacou and flights to Grenada. Getting away from it all includes getting away from massive airports with multiple terminals flying massive aircraft. We operate small airplanes that fly into small airports located on small islands. These cozy planes may provide a fun ride at times but that is part of the experience and they will take you directly to that small island. 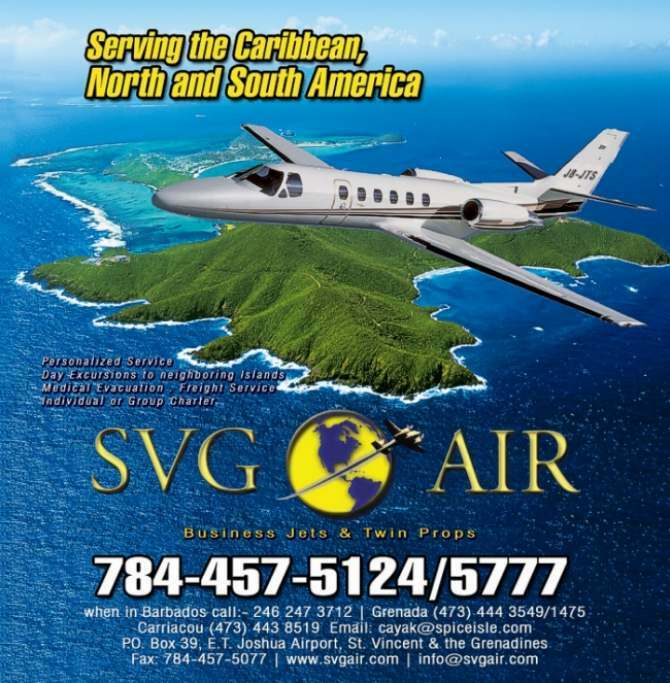 To book flights, private aircraft charters and other services please contact SVG Air. Grenada telephone: +1 (473) 444-3549 or +1 (473) 444-1475. Carriacou telephone: +1 (473) 444-8519. Osprey Ferry schedule Grenada – Carriacou – Petite Martinique. Click the ferry schedule to enlarge. Osprey schedule Grenada to Carriacou and back. Osprey ferry between Carriacou and Petite Martinique. Ferry services between Grenada and Carriacou. Video of the Osprey ferry passing Sandy Island. The Osprey ferry on the Jetty in Saint Georges on Grenada. Arrival of the Osprey Ferry on Carriacou. Top deck of the Ferry. The Osprey moored at the jetty in Hillsborough. The Osprey Ferry leaves in Grenada from the Carenage in Saint Georges. If you arrive on Grenada by plane you will have to take a Taxi or Bus from the Airport to the Carenage. Taxis, mini buses and twin cab vans provide regular and efficient service. Jeep rentals are also available. In the center of Main Street in Hillsborough is a stand where all minibus taxi’s depart. The bus stop is at a few steps from the pier where the Osprey ferry arrives. Departing from the dock you will find the bus stop on your left. The best way to get around the island in an economical way is using the public transport. These are small vans with about 10 seats. Usually you get a ride by standing by the side of the road and waving to stop the bus driver. Beware, minibuses usually do not run in the evenings. if you go out for a dinner or a drink at a distance then you should arrange transport back prior to leaving. Car hire and mopeds for rent on Carriacou. There are several companies which rent out Jeeps and small motorbikes. The rates are usually fair, vehicles vary in condition. All hotels and guesthouses can arrange for a car hire. This is a good option if you want to dispose of transport from the moment of your arrival. SVG flights between the southern Caribbean islands. Turtle laying eggs on Silver Beach Carriacou. at 0.30 km. Sunset on Paradise Beach. at 0.70 km. Paradise Beach pictures, bars restaurants and lodging. at 0.77 km. L’esterre and paradise beach on Carriacou. at 0.87 km. Miss piggy goes bathing on Paradise Beach. at 0.98 km.